Occupied Jerusalem, ALRAY-Israeli settlers stormed Thursday morning Al-Aqsa Mosque under protection of Israeli occupation police. According to Jerusalem sources, 63 Israeli settlers stormed Al-Aqsa Mosque, and carried out provocative tours in its courtyards. The sources added that the Israeli police imposed strict measures on the entry of Palestinians to the areas of the Temple Mount “al-Ḥaram al-Šarīf”. 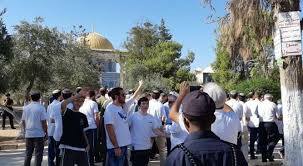 The so-called "organizations of the allegedly temple intensified its calls in the last two days for its supporters and settlers to participate extensively in storming Al-Aqsa coinciding with the "Jewish festival of Purim”.